It was time for a big red sometime two weeks ago. And the Sessantanni was what I had in mind. Let me give you a bit of background on how I found this particular wine. It was during the last weeks of my time in Germany in 2011. I tried to cram meeting friends and doing cool stuff into my limited time. One of the things I did was visit with one of my cousin’s and several friends in Wiesbaden, just across the river from Mainz. My cousin told me we had to go and visit the wine shop he goes to. And as you can imagine, I had no objections. So we went ahead and visited “Le Bonheur” on a Friday evening. Two of my good friends from Trier times tagged along. To shorten things, we had a blast. The owner, Andreas, is a fabulous guy, generous in offering us to try whatever we wanted, knowledgeable, friendly and chatty. The perfect wine shop owner. We tried, and talked and talked and talked. I remember my cousin had to pretty much pull me out of the store because we had a dinner reservation…Andreas’ wine store is sitting over a former champagne cellar, so he also showed us the downstairs where he is now producing his own champagne. It was epic there. If you ever get to Wiesbaden, and in fact a number of Americans do because there is a large military base and it is only 25 minutes from Frankfurt, it is well worth a visit. Andreas speaks great English, too. When we went back to the store last summer, Nina found the Italian Merlot we had during the last wine tasting I wrote about. Our tasting at Le Bonheur…I wasn’t joking about the generosity of its owner! But back to this wine. One of Andreas’ most endearing traits is that he never wants to let you go. So right before we were to leave his place, he said there was just one more wine to try: The Feudi di San Marzano Sessantanni, a primitivo. The label and bottle were gorgeous, and when I picked up the bottle, I could not believe how heavy it was. It is by far the heaviest single bottle I ever held. We tried this dark, brooding wine and I instantly fell in love. It was just right on a late November evening. Fabulous. So, I waxed on and on until my cousin decided to buy a bottle as a gift for Nina and me…and it actually made it across the pond. And then it was sitting in our wine rack, waiting to impress Nina. Let me give you some more background on the wine: It is named “Sessantanni”, or 60 years, because the vines that the grapes were grown on are over 60 years old. The vines grow in Apulia, on the peninsula Salerno, in Southern Italy. The winery, Feudi di San Marzano (great website, well worth checking it out), is a new creation. It was established in 2003 by a cooperation of the Cooperative San Marzano and Farnese Vini from the Abruzzo region. Farnese is said to provide the know-how and the cooperative provides its vineyards. 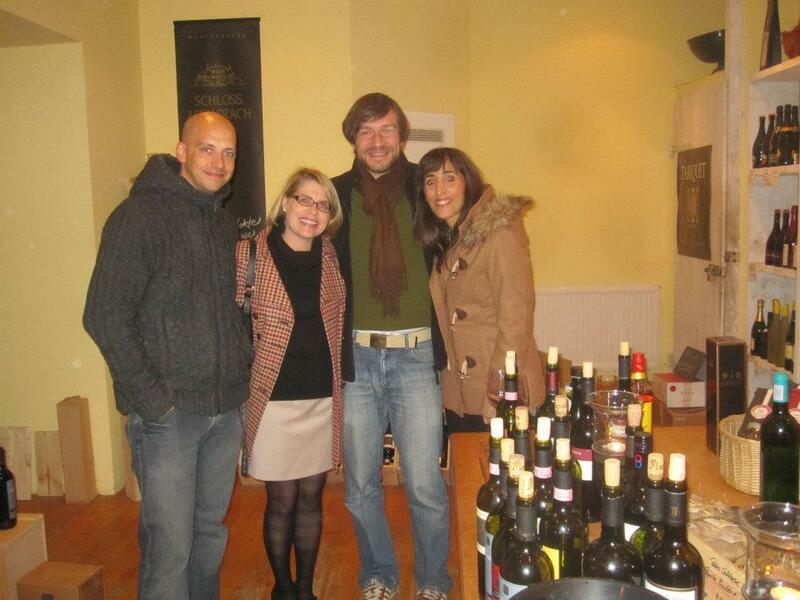 According to the German wine retailer Belvini, the winery has garnered a lot of attention and won numerous prizes. The Sessantanni is its flagship red. The 2008 vintage has 14.5% ABV. Its denomination “Primitivo di Manduria”, which according to the wine label is a protected designation of origin (DOP), according to Wikipedia it is a denomination of controlled origin (DOC) – apparently a DOC or DOCG is also always a DOP – ensures that it is made with 100% Primitivo grapes. The vines are grown around San Marzano and Sava in red soil rich in iron oxide. Grapes are hand-harvested in September and the wine ages in American and French wood barrels. 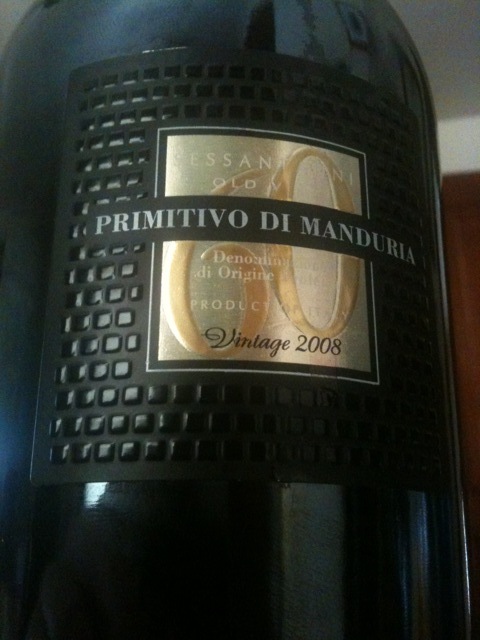 This Primitivo di Manduria poured in the dark, brooding ruby red that I remembered. Its nose was full of sweet tobacco, candied cranberries, plum and Alpine flowers. Really pretty, really charming. On the palate, the wine felt medium- to full-bodied. The first things I wrote down were deep, full, rich, ripe. It had a refreshing, mouthwatering acidity to it that was not disturbing but rather welcome. When I dove deeper into figuring out what was going on, I got some vanilla, some almond bitter, cedar and spice box. The tannins were exceptionally well integrated. The wine showed some heat, but that was not surprising given the high alcohol level. There was also a jammy sweetness to the wine. Its long finish made me taste milk chocolate. I loved this wine, just like I loved it when I first tried it. Nina, as I had hoped, was all over it, too. As the evening progressed, the wine became more and more a fruit bomb, which was a bit unexpected but nonetheless very enjoyable. The more I try Southern Italian wines, the more I enjoy them. I am for example very fond of Salice Salentino, which is also from Apulia. Their deep and brooding nature appeal to me. If you get a chance, I highly recommend this wine. It retails for somewhere above 20 euros in Germany ($27), Wine Searcher lists an average price of $35 pre-tax and shipping in the US. Southern Italy is still very much unrecognized and underrepresented in our common wine conscience. It means we can get exceptional value for the price. While I recognize this wine is outside of my usual price line, I still believe it is a great bargain. 60anni is Really good red wine! What great descriptors!!!! Made my mouth water! Ha, so funny! You know I had a bottle of 60anni about a week ago and it is in my wine review to do list! Excellent review as always, Oliver: when I write mine, I will definitely link back to yours. And (unsurprisingly) I totally agree with your tasting notes: a little bit of an exuberant fruit bomb and plenty of dark chocolate flavor, but well integrated together. I enjoyed it a lot, although it is so “rich” a wine that I would not drink it regularly (if price were not an issue, of course!) – I think you need to pace yourself a bit with this wine. Stefano!! That is hilarious!! How awesome that we might have tasted this wine at around the same time. I cannot wait for your notes!! I agree, it is a wine that is not for every night for sure. And it is a fruit bomb for sure…. I have to apologize, I didn’t even notice your Italian Riesling reviews…I was pretty much off the blogosphere for a good week. I am super intrigued now. Will head there right after the Bayern-Barca game. Thanks for stopping by, as always!! Finally, congrats: you guys just crushed Barca! What a display of power! I learned from my father that during the week you support Bayern for the good of the UEFA ranking. But on weekends you hate them…:) They have had an incredible season, and this was the best I have seen them play yet. Unbelievable. Sounds like a fabulous red – I want Andreas to move to Nashville. Like yesterday. I wish it was as easy to find gems like this where I live! (Or maybe it is and I am simply not adept at finding them yet. Yet.) Traveling seems to be by far the best way to experience wines! I’m glad your wife enjoyed it as much as you do because there is nothing quite like sharing a beloved wine with someone and seeing them fall for it as well. I whole-heartedly agree that a shared beloved wine that is appreciated is one of the best wine experiences there is. It can be tricky to find these gems but that is where a good wine dealer comes in, too. Without Andreas, I would never have tried this wine.